3. So What Does the Fed Really Intend to Do? Recent communications from the Fed and comments by Chairman Bernanke cast a great deal of uncertainty on the equity and bond markets in late June. Specifically, Bernanke’s remarks in his press conference on June 19 – where he discussed ending its program of quantitative easing – prompted a huge global selloff in the stock and bond markets. In response, various Fed officials tried to “walk back” the idea that the Fed was ready to begin scaling back its $85 billion a month in bond and mortgage purchases as early as September and end the program by mid-2014. Based on those reassurances, stock prices recovered, but rumors of the Fed scaling back its stimulus later this year continued to circulate. With that news, the Dow Jones and the S&P 500 indexes surged to new record highs last Thursday. It is obvious that the equity markets are addicted to the Fed’s stimulus. It remains to be seen, however, what this latest Fed decision will mean for the sagging bond market. So far, not much. Finally, there is something REALLY BIG brewing with regard to ObamaCare. President Obama’s recent decision to postpone the “employer mandate” by one year to 2015 may have been unconstitutional. If you oppose ObamaCare, you absolutely must read the final section of this E-Letter. You won’t hear about this in the mainstream media. If you don’t read anything else, scroll down to: Delay of ObamaCare May Backfire on the President. You need to know about this. It seems that hardly a week goes by when we don’t have some kind of news related to the Federal Reserve, and particularly the Fed Open Market Committee (FOMC) that sets monetary policy. Given how much the FOMC affects the economy, interest rates and certainly the markets, I thought a quick review of the FOMC might be in order today. This powerful committee was formed by the Banking Act of 1933, which was amended in 1942 to give it the current structure of 12 voting members. The permanent members of the FOMC are the seven members of the Fed Board of Governors, including Fed Chairman Ben Bernanke. The president of the Federal Reserve Bank of New York is also a permanent member. The other four members are selected annually from the remaining 11 regional Federal Reserve Bank presidents (who serve one-year terms on a rotating basis). Since the make-up of the voting members of the FOMC changes each year, this can have an effect on policy decisions. Some members favor “easy money” policies, while others are more fiscally conservative. But despite their monetary leanings, policy decisions are heavily influenced by the chairman. This influence is always critical but especially now, since Bernanke’s term as chairman ends in January. President Obama recently made it (rudely) clear that he will not offer Bernanke a third term as Fed chairman (not that Bernanke wanted one). It is widely expected that Obama will appoint Board of Governors member Janet Yellen to succeed Bernanke as chairman. Ms. Yellen is considered one of the most dovish members of the FOMC. If Ms. Yellen becomes the Fed chairwoman in late January, it will be interesting to see what happens to the current $85 billion a month in QE purchases, especially since she has argued for even more QE. I will have more to say about QE ending, or not ending, below. The FOMC meets eight times each year in Washington, D.C. Immediately following the meetings, the FOMC issues a policy statement including any changes that were voted on. Then apprx. three weeks later, the actual minutes of the meeting are released. Both the statements and the minutes can affect the markets significantly. Given how much the Fed’s recent decisions and changing positions on QE have affected the stock and bond markets this summer, I thought it might be helpful to revisit the timeline. Let’s begin with the FOMC’s decision last December to begin monthly purchases of $40 billion in mortgage-backed securities and $45 billion in long-dated Treasury bonds. At the time, the Fed said it would continue these historic purchases until the unemployment rate fell to 6.5%. While we’re nowhere near 6.5%, some members of the FOMC have suggested slowing these purchases and even ending them at some point. The FOMC began discussions about slowing QE purchases at its March 19-20 policy meeting. Yet all but one member voted in favor of continuing the $85 billion a month in QE purchases at that meeting. The same thing happened at the April 30-May 1 meeting. But the mere fact that the FOMC had discussions about ending QE for a second meeting in a row did NOT sit well with the bond markets. Yields on long-dated bonds have soared since early May. As you can see, bond yields began spiking higher immediately after the April 30-May 1 FOMC meeting. The 30-year Treasury bond yield rose from 2.9% to near 3.7% (an increase of 27.6%) since early May, thus resulting in serious losses for long-dated bonds. Given the magnitude of the loss in 30-year bond prices and to a lesser extent in shorter-dated Treasuries, there is no doubt that the members of the FOMC are well aware that even the hint of scaling back or stopping QE purchases is very negative for those bonds. Next, we come to the June 18-19 FOMC meeting where the Committee once again decided to continue the $85 billion a month QE purchases indefinitely. However, in his press conference following the conclusion of the June 19 meeting, Bernanke once again reminded the media that the Fed would consider “tapering” its monthly QE purchases only if the economy continues to improve. The bond market wasn’t buying it, and yields continued to rise. The market carnage over the Fed’s threat to taper was not confined to bonds. Stocks didn’t like it either. The stock market rally that began in November of last year peaked in late May amidst all the taper talk. Stocks trended lower until late June when they reversed sharply higher. As a result, the Dow traded lower from late May until late June when stocks reversed direction. Note that this was only after several FOMC members made statements that essentially said that the Fed is not considering tapering anytime soon. Unlike bonds, which continued to fall even after the comforting remarks from those Fed officials, stocks went on a tear to the upside in late June. Now let’s move on to the minutes from the June 18-19 FOMC meeting, which were made public last Wednesday. While the members once again talked about reducing QE at some length, the end result was the same – another near unanimous vote to continue the $85 billion a month indefinitely. So What Does the Fed Really Intend to Do? The bottom line is that the Fed appears to be committed to continuing QE at a pace of $85 billion a month for the time being. However, it also appears that a growing number of FOMC members believe the Fed should be making plans for the tapering of QE purchases and an eventual end to the program sometime next year. However, you wouldn’t know that based on some comments from Bernanke in a speech to a group of economists in Cambridge, Mass. last Wednesday. It seems obvious that Bernanke is still very concerned about the continued rise in long-term interest rates, despite recent assurance from several FOMC members that tapering will not happen anytime soon. To my knowledge, Bernanke has not used those words before. If we are to take Bernanke at his word, this means that “tapering” or ending QE is off the table, and this is a complete reversal for the Fed Chairman. Obviously, this comment got a LOT of play in the media and the markets late last week. With that news, stocks soared to a new all-time high in the Dow and the S&P 500 last Thursday. Yields on 10 and 30-year Treasury bonds fell only modestly after Bernanke’s surprising comment. It remains to be seen if bond yields will come down significantly in the weeks ahead, as the Fed hopes. I wouldn’t bet on it. Finally, my read on Bernanke’s latest change of heart is that he has decided to wait and let his successor decide what to do about QE. As discussed above, if Janet Yellen is Bernanke’s successor at the Fed in January, QE could become a permanent fixture at the nation’s central bank. Let’s hope not! President Obama announced on July 2 that he was postponing the Affordable Care Act’s “employer health insurance mandate” for one year until January 1, 2015. Obama did so without congressional approval, or any approval for that matter. The question is whether or not the president had the authority to make such a unilateral decision, and in doing so he may well have exposed his actions to judicial review – even though that is clearly what he sought to avoid. Why is this so important? Two reasons. One is the decision itself, which could be overturned by the courts. But far more importantly, by making this decision unilaterally, Obama may have inadvertently created a legal pathway for overturning the “individual mandate” that requires Americans to purchase healthcare insurance or pay a fine starting in 2014. The point is, if the individual mandate is overturned, ObamaCare collapses. This matter is quite complicated as it relies on numerous legal technicalities which I am not familiar with. So what follows is a summary of an article written by David B. Rivkin, Jr. and Lee A. Casey which appeared in the Wall Street Journal last Sunday. I want all of my readers to know about this. The healthcare reform law’s employer mandate requires businesses with more than 50 employees to provide a congressionally prescribed set of health-insurance benefits or pay a penalty calculated at about $2,000 per employee. The law was to take effect on January 1, 2014, but Mr. Obama “postponed” its application until 2015. His aim, the administration said, was to give employers more time to comply with the new rules. Maybe so. However, the president’s surprise decision was also seen by many as a way to delay the very unpopular employer mandate until after the 2014 mid-term congressional elections. It is widely believed that ObamaCare could be the main political issue come election time. Whatever the reason, the president does NOT have the power to stop the implementation of a federal law, at least according to Rivkin and Casey who were among the attorneys that represented 26 states in the fight against ObamaCare all the way to the Supreme Court. Rivkin and Casey argue correctly that if there is one bedrock constitutional legal principle, it is that the president must “faithfully execute” all federal statutes. He cannot suspend laws he dislikes on policy grounds or because he fears their political consequences. 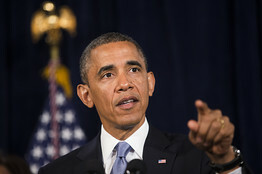 The authors correctly point out, however, that Obama has made a habit of exercising an unlawful suspending power and refusing to enforce selected federal laws, including: 1) various provisions of the immigration laws against young, undocumented aliens; 2) work requirements enacted as part of the 1996 federal welfare reform law; and 3) the testing accountability provisions of the “No Child Left Behind” education law. One key problem with suspending federal law is the fact that it destroys the balance of power between the two political branches. Even worse, suspending or refusing to enforce federal law – when skillfully exercised – can bypass and sideline the courts. This is where it gets a little complicated, but this is something we definitely need to understand. The Constitution requires that a party commencing litigation must have what is commonly called “standing.” That is, the party initiating the litigation must have suffered or will suffer a legal injury that a court can address. A determined president can head off litigation by effectively rewriting federal statutes in ways that do not create individual injuries, so no party has standing in the courts. And here’s where it gets really interesting. By suspending the Affordable Care Act’s employer insurance mandate, Obama has potentially given millions of Americans the necessary standing to challenge his conduct. This is because the Affordable Care Act is a highly integrated law, with many of its key provisions dependent on each other. The employer mandate and the individual mandate were the core parts of the Affordable Care Act considered by the Supreme Court in 2012, where the court upheld the statute against constitutional attack. Throughout that litigation, the Obama administration portrayed the individual mandate as an “integral part of a comprehensive scheme of economic regulation” that included the employer insurance mandate. The employer mandate was intended to give millions of Americans a way of meeting their new obligation to have health insurance. In other words, suspending the employer insurance mandate prevents the individual insurance mandate from working the way Congress intended. Once in court, these litigants can argue that the very integrated nature of the Affordable Care Act would make it unlawful to apply one part against them, while suspending another section. They can also argue that only Congress can determine whether, once a statute is fundamentally changed post-enactment, it should survive or fall. In conclusion, ObamaCare is now even more unpopular than it was when it was passed by hook or crook, without a single Republican vote. Obama knows this. Whether he postponed the employer mandate to give employers more time to prepare for it, or because he knows it will hurt Democrats in the 2014 mid-terms, we will never know. I strongly believe it was the latter! The point that authors Rivkin and Casey make is that Obama did NOT have the authority to unilaterally postpone the employer mandate. That decision may be rendered unconstitutional. But more importantly, the postponement may have given individuals not covered by their employers the legal “standing” to sue. This is absolutely critical. It may be the only chance to stop ObamaCare. I’ll keep you posted.